The rise of digital health technologies is, for some, a panacea to many of the medical and public health challenges we face today. This is the first book to articulate a critical response to the techno-utopian and entrepreneurial vision of the digital health phenomenon. Deborah Lupton, internationally renowned for her scholarship on the sociocultural and political aspects of medicine and health as well as digital technologies, addresses a range of compelling issues about the interests digital health represents, and its unintended effects on patients, doctors and how we conceive of public health and healthcare delivery. Bringing together social and cultural theory with empirical research, the book challenges apolitical approaches to examine the impact new technologies have on social justice, and the implication for social and economic inequalities. 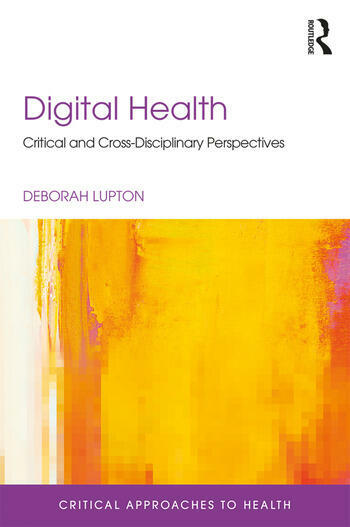 Lupton considers how self-tracking devices change the patient-doctor relationship, and how the digitisation and gamification of healthcare through apps and other software affects the way we perceive and respond to our bodies. She asks which commercial interests enable different groups to communicate more widely, and how the personal data generated from digital encounters are exploited. Considering the lived experience of digital health technologies, including their emotional and sensory dimensions, the book also assesses their broader impact on medical and public health knowledges, power relations and work practices. Relevant to students and researchers interested in medicine and public health across sociology, psychology, anthropology, new media and cultural studies, as well as policy makers and professionals in the field, this is a timely contribution on an important issue. Deborah Lupton is Centenary Research Professor in the News and Media Research Centre, Faculty of Arts and Design, University of Canberra, Australia. Author of 15 previous books, she is an internationally renowned scholar whose research spans sociology, media, communication and cultural studies.